The objective of this study was to compare the CYP 21A2 genetic profiles of couples with unexplained fertility problems (UFP) with genetic profiles of healthy controls (HCs). Furthermore, we analyzed associations between mutations in the CYP21A2 gene and various clinical and laboratory parameters. Allele- specific polymerase chain reaction (PCR) was used in 638 probands with UFP and 200 HCs. 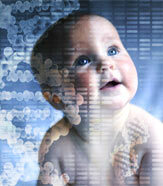 Statistic analysis with χ2 was used to study the association of mutations with infertility. The effect of mutations on particular clinical and laboratory parameters was assessed with the analysis of variance (ANOVA) test. With regard to the CYP21A2 gene, 0.6% of probands with UFP and 0.5% of HCs were positive for the c.290-13A/C>G mutation; 0.6% of probands with UFP and 1.5% of HCs were positive for the p.I172N mutation; there were no probands with UFP positive for the p.P30L mutation, whereas 0.5% of HCs were; and 0.2% of probands with UFP and 0.5% of HCs were found to have the p.V281L mutation. We found a significant association between c.290- 13A/C>G mutation and the frequency of significant hormone deviations (χ2 = 6.997, p = 0.008). Similar association was also observed between the c.290- 13A/C>G mutation and the frequency of polycystic ovary syndrome (PCOS) (χ2 = 16.775, p = 0.000). Our findings indicate that no significant difference in the prevalence of CYP 21A2 mutations can be found in probands with UFP when compared with HCs without infertility history. The results also imply the significant association of the c.290-13A/ C>G mutation in the CYP21A2 gene, not only with the frequency of PCOS, but also with the frequency of significant hormone deviations.